At work we have samples of injection molded parts from Quickparts, that demonstrate some of their capabilities. 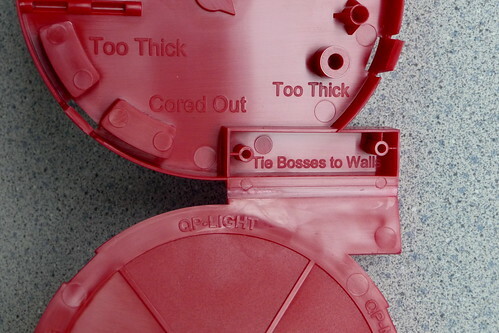 My favorite feature is inside the red sample, which says, "Tie bosses to walls." They mean mechanical bosses, not your boss watching over you as you giggle. But sometimes when the boss acts up, we all want to take this part and whack him with it, since we can't actually tie him to the wall. 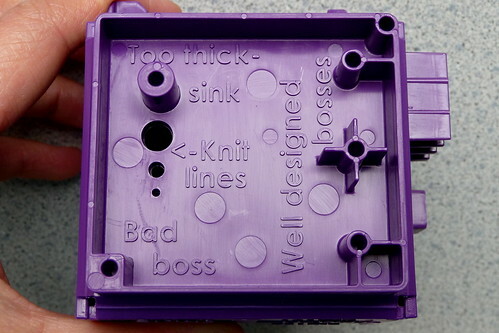 The second part demonstrates a "bad boss" and "well designed bosses." I would like to order one well designed boss please. One who gives me accolades and great raises. That is really funny. I could have used that when I was working in an office. Ha! Wouldn't THAT be nice? P.S. We like to call my son's PJ's his "Beetlejuice" outfit!! That is too funny! Great pictures too, I love the lighting. I have no clue what that is for! Those are really cool gadgets which I wouldn't mine to have myself. Hehehe, I like those pieces and parts! Oh I'd say there's a market for boss tieing. Perhaps look into dual purpose items...hehe. LMAO! I am going to have to find that for my husband to take to work with him! His bosses would love that. Oh my goodness!! I am giggling up a storm over here. That is TOO funny! That is funny! It would make me smile every time too. Sorry I'm commenting late but this is a great Wordless Wednesday! LOL - this is too hilarious! I love it..